Voted Best Creche 2016 & 2017! At Giraffe childcare we’ve created a special place where your child’s sense of wonder and natural curiosity are nurtured every day by our passionate and enthusiastic team. 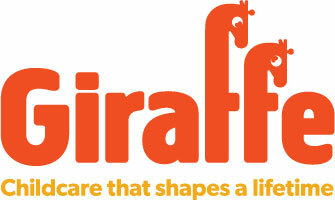 During their time with us at Giraffe we’ll play our part in helping your child to develop their social skills and gain increasing independence. Contact us today to arrange a visit to our centre! Winner of Best Crèche - Mums &Tots awards 2016 & 2017! Our purpose-designed crèche is based over two floors, with a warm and welcoming feel and we offer a range of opportunities for your child to learn through imaginative and creative play. We also have a wonderful garden in which the children play all year round and they particularly enjoy splashing in the puddles! Voted Best Crèche in 2016 & 2017! At Giraffe childcare we’ve created a special place where your child’s sense of wonder and natural curiosity are nurtured every day by our passionate and enthusiastic team. During their time with us at Giraffe we’ll play our part in helping your child to develop their social skills and gain increasing independence. Contact us to today to visit our centre!